Virtual agriculture has recently become a bit more spliffy. If conventional farming simply isn't your thing—or if you're too half-baked to feign an interest in produce and husbandry—then the Facebook game Pot Farm may be just the foray into horticulture you've been jonesing for. Pot Farm (which is is still currently "totally Beta or whatever") operates much as you'd anticipate from a Facebook-hosted farming game: players are encouraged to develop and nurture a plot of land, and hopefully rake-in a steady influx of virtual capital...or not. "A friendly woodland growing game, chilled out camping with a bit of gardening on the side" is the decidedly chill manner in which the title is described on developer Downtown East Side Games' website. Players can expect an assortment of absurd goings-on. Five minutes into a play-test, I found myself having to determine what best to do about "a confused dopey duck" that had "wandered onto my farm and needed a place to crash." This was after I had passed a few aimless moments having my dreadlocked avatar putter about a field that was strewn with empty bottles and trash. 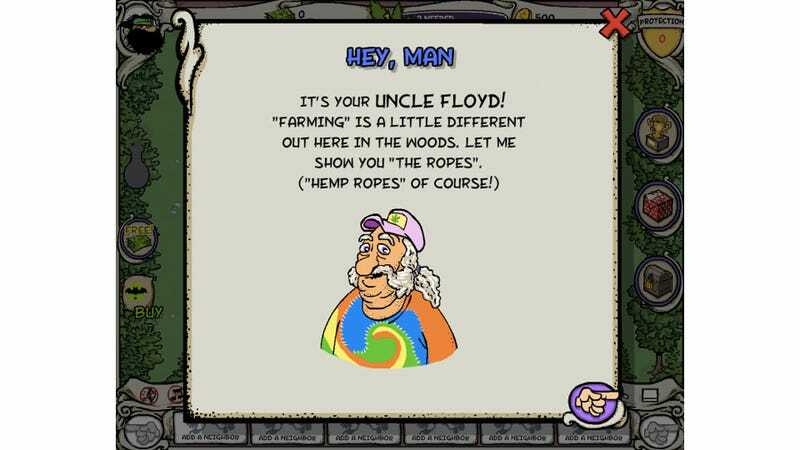 But don't be mislead by Pot Farm's high-as-a-kite attitude into thinking that the game itself is slouchy. The title is a finalist at the Canadian Video Game Awards for "Best Social/Casual Game," and is apparently generating $150K a month in revenue. How many of your deadbeat, pothead pals can claim as much? This Week in the Business: "Itching for a while."